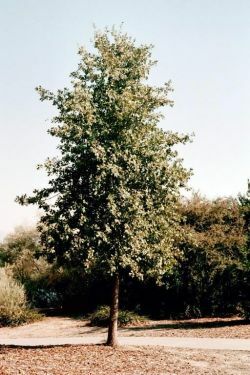 Comments: Deciduous tree native to the Central Valley and foothills of the interior of California. 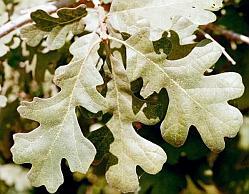 It has dark silver-green leaves which are deeply and irregularly lobed, large rounded acorns, and dark brown bark. Tree tends to a round shape with width and height being about equal. Mature trees to 70', but specimen is only about 15'. Tree is drought tolerant but needs a reliable source of ground water.